I don’t care who you are, you cried at the end of “The Iron Giant.” | Name-Brand Ketchup. “I am not a gun.” “You are who you choose to be.” “No following.” “Superman…” If you didn’t get verklempt at that, you seriously need to check your own pulse. Maybe I need a Desert Island Movies category. I’m a huge animation geek, and this is easily one of my five top favorite animation films. “The Iron Giant” choked in the box office, buried under a deluge of flashy films, all of which suffered from a serious dearth of heart and soul. It didn’t help that the advertising campaign was painfully bad, embedding a pretense of “crappy kids’ movie.” And, of course, the animated motion picture genre is decidedly handcuffed by Disney, and any non-Disney flick is sure to elicit cynicism from the kids (the prime demographic for a movie like this). But forget all that…”The Iron Giant” is a fine movie. Actually, I would go as far as to say it’s the best animated movie I’ve ever seen. Forget everything you’ve ever thought about animated films. Just for kids…bad script…juvenile humor…long, boring music numbers…talking animal sidekicks with lame one-liners… Forget it all. Instead of staying shackled to convention, “The Iron Giant” eschews all the faults associated with other animated films, and simply delivers a charming film that anyone can enjoy. Pardon the cliché, but in this case, it is absolutely true. “The Iron Giant”‘s story is delightfully captivating in all its exquisitely crafted facets. The script is irresistible, tastefully witty, and profoundly moving. Time and time again, I marveled at how a single scene could be better than entire movies. The giant robot character is a stranger in a strange land, and his (mis)adventures with Hogarth (the young boy who befriends the robot) are accompanied with elegant humor, but sometimes the lighthearted moments relinquish themselves to emotionally-stirring segments. If the ending doesn’t have you holding back tears, you simply aren’t human. 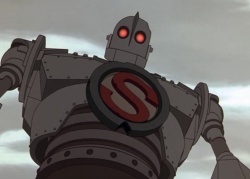 The iron giant himself succeeds in being the ideal non-human character with a very important human element, and that’s one of the greatest merits of this movie’s story. From a technical standpoint, the animation is simply breathtaking. Special accolade goes to the technique used on the iron giant himself. He is rendered with computers graphics, but with a special cel-shading technique that makes him look hand-drawn. This allows him to seamlessly blend in with the hand-drawn environments and other characters. Some people will certainly pass by “The Iron Giant.” They’ll return to their Disney flicks — movies that are so engineered to be impressive that they somehow fail. These people will never know what they missed. That is because “The Iron Giant” is so much more than any other animated movie. It’s a ride through a timeless story and human emotion that few movies match, much less animated films. Lofty praise, certainly, but every word of it is sincere and true. Watch it, and you’ll agree. Clip from Youtube. Song: “Innocence” by Avril Lavigne.